The Mughals era has left a prominent mark on the historical landscape of the sub-continent. Their imprints are there be it culture, tradition, lifestyle, religion, administration, socio-political fabric or architecture. The contribution is immense with all the richness that lies between the corridors of these monuments. They also contributed to improve connectivity scaling down the vastness of Indian subcontinent with building of the network of roads and pathways. The Mughal Empire existed from the mainland till the suburbs of Hindu kush. One of the many remarkable connecting routes dating back to the Mughal era is the Mughal Road passing across the Pir Panjal mountain range. Emperor Akbar and his son Emperor Jehangir regularly took this route to travel to the beautiful vale. After many centuries, the Government of Jammu and Kashmir in 2005 started construction on this forgotten link that was frequently chosen by the royals of the Mughal empire to travel to Kashmir. The road unifies and brings closer the districts of Poonch and Rajouri to the Kashmir valley. The construction and renovation of this route is in the final stages and the completion of the project will bring alive the forgotten legacy and unearthen the beautiful architectural and historic treasures of Mughal era. A number of monuments built by Mughals adorn the route making it significant and a treat for visitors. The monuments include Pir ki Gali, Noor Mahal Fort, Anayatpura Sarai, Dhanidhar Fort, Shalimar Garden, Nain Sukh Sarai, Saj Saria, Thannmandi Fort and Sarai, Deragali Fort, Norrichamb and Aliabad Sarai, Shadimarg Sarai and Chingus Sarai among many others. Most of these monuments were used as halting stations and inns by the Mughal travellers while taking this route. An inn is supposed to be a simpler makeshift shelter but the majesty of these structures speak loudly about the grandeur with which the Mughal royals associated themselves. However, the downfall of the Mughals led to the neglect of these architectural marvels for centuries. While Mughals kept on building stunning marvels throughout their tenure, there are other monuments hidden in the roads paved by them that can never be ignored. Each one of them has a fascinating story to tell. One of these interesting structures hidden in the wilderness of the Mughal road is the Chingus Sarai, built by an Iranian architect during the regime of Emperor Jehangir. Chingus Sarai is situated on the stretch between Nowshera and Rajouri lying about 130 kilometres away from Jammu city. Chingus Sarai served the Mughal caravans for about two centuries till the downfall of the Empire. The sarai was an important halting station as realised by the architecture and the built of the structure. The word ‘Chingus’ derives its meaning from Persian language meaning ‘gut’ or ‘intestines’. In 1627 A.D., Emperor Jehangir while travelling via Mughal road fell seriously ill and passed away at a village known as Khanpur in Rajouri. Queen Noor Jehan who was accompanying the Emperor took a bold decision to hide the news of the death of Emperor in view of a possible succession tussle among the heirs. It was decided to take the body to Lahore for burial. To avoid any possibility of decomposition of the mortal remains of the Emperor Jehangir during transit, the viscera were removed out of the body and buried within the confines of the transit camp. After the burial of entrails, this Sarai came to be known as Chingus Sarai. Since then village Khanpur became Chingus. The dead body was then rested on an elephant in a way to conceal the death of the Emperor and taken to Lahore for burial. 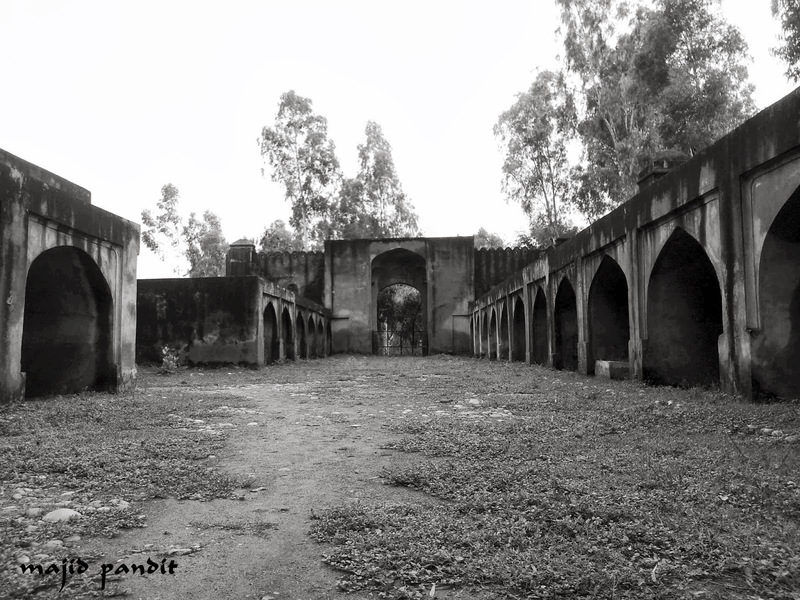 It is believed that the doctor who removed the entrails was also buried inside the Sarai. The Sarai complex has a small mosque in the centre. In the corridor of the mosque is the burial place of the entrails of Emperor in the form of a tomb made up of marble. This magnificent structure reflects a special feeling once you step inside via the main entrance. On my recent visit, it felt like entering a beautiful maze of symmetrical residential cells and surrounded by thick brick wall enclosure. I could imagine the buzz when royal caravans would have halted at this beautiful camping structure. The background and the story of this structure in itself merit praise. The fort was supposed to cater to large armies, numerous stables and feeding rooms inside the brick walls. 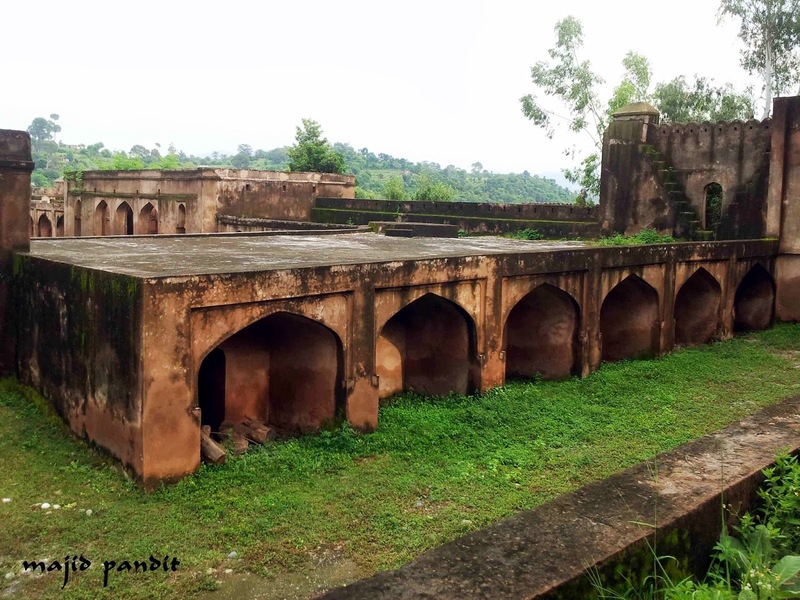 Though at a slower pace, the authorities have done well in considering the importance of this royal inn as well as other similar monuments across this ancient route. In June 1984, Chingus Sarai was declared as a ‘State Protected Monument’ by the Government of Jammu and Kashmir. The Government of Jammu and Kashmir has already spent Rs. 93.80 crore on major restoration and conservation works of Chingus Sarai and efforts are being made to complete the pending tasks at the earliest. In the early 1990s, a few huts were built by the tourism department near the Sarai for tourists however, the huts could not be used for the said purpose. Things have started changing now with the growing interest of visitors that has constrained the concerned authorities to come up with schemes for the revival of its pristine glory. To trigger tourist influx, Jammu And Kashmir Tourism Development Corporation has put on anvil ‘caravan tourism’ for the revival of the historic essence of Mughal road. These caravans will bring alive the magic of journeying on the route. Individual as well as collaborative steps need to be taken to improve the access of such historically significant sites spread across this picturesque route. Inclusion of ample information about the historical background of such sites in the curriculum will encourage the children. Conducting learning trips and heritage picnics for educational institutions on the theme of importance and conservation of heritage structures if pursued would help in sensitizing the masses about the rich history through such relics of our past. 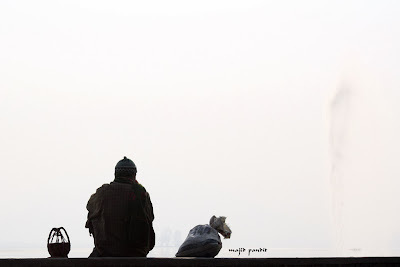 Old man and his Kanger (a pot filled with hot embers) sits on the bank of Dal Lake.